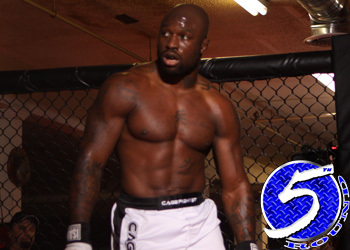 Former light heavyweight champion Muhammad “King Mo” Lawal not only lost his belt to Rafael “Feijao” Cavalcante at “Strikeforce: Houston,” but it appears the flamboyant wrestler has lost the next nine months as well. Sherdog.com reports that Lawal will have surgery next Tuesday on a knee he injured during Saturday night’s defeat, the first of his professional career. “Mo wanted to take one more fight, but we decided that this injury should be attended to first,” Lawal’s manager Ryan Parson’s told the website. Lawal will have both his ACL (anterior crucial) and PCL (posterior crucial) ligaments repaired. The report did not indicate which wheel was injured or whether the procedure would be done on the same knee Lawal had surgery on in March 2009. The former champ was perfect through his first seven bouts prior to his tango with Feijao and was coming off the biggest win of his career when he upset Gegard Mousasi at “Strikeforce: Nashville” to capture the crown. Cavalcante defended nearly all of Lawal’s takedown attempts on Saturday night, but when his back finally hit the mat he was able to immediately squirm back up. He used a perfectly placed knee to rock King Mo before finishing him off for good in the 3rdRound.